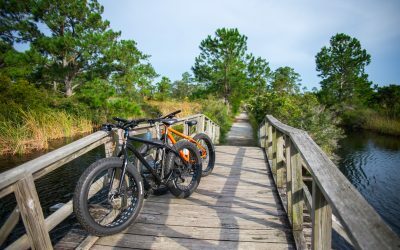 Pensacola Private Mountain Bike Tours | Book a Tour Private Today! The tour can be either 6, 8 or 12 miles depending on how long you want to ride. The route consists mainly of flat, winding single-track and a few very short sections of sandy double-track. 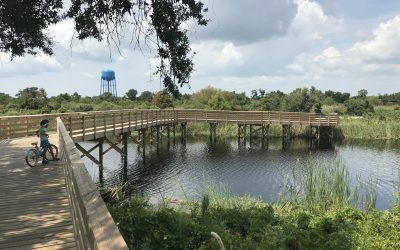 It is mostly in forested areas with occasional views of Pensacola Bay. 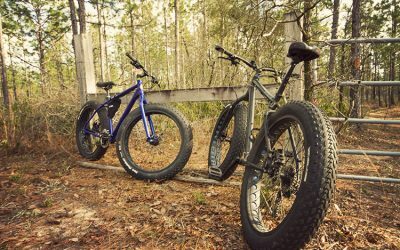 You will be riding on well-maintained fatbikes, with 27-speed drive-trains, 4 inch tires, and hydraulic brakes. Helmets, gloves and water will be provided. In the warmer months plan on riding as early as you can do, as the heat gets intense quickly in the Florida sun. Much of the ride you will be exposed to the sun so sunscreen is a good idea. This is an off-road, narrow trail ride and you should have basic off-road biking skills, and you should be in moderately good shape because you will get a workout. There are no real hills but the short sandy sections can zap your energy, even on fat bikes. We take no more than 3 guests per tour and no one under the age of 16 (ID is required by our insurance). The typical 8 mile tour will take about 2 hours to complete, but could take longer depending on how many stops. Near the end of the ride there will be a beach break where you can hang on the beach and have a snack or take a dip in the water to cool off. If you would like to book a tour, please fill out the form below and we will respond back within a few hours. Thanks for choosing Hamilton Mountain Bike Tours as part of your vacation.